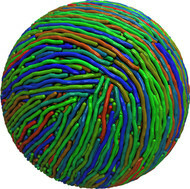 Theoretical physicists led by Professor Kurt Binder and Dr. Arash Nikoubashman at Johannes Gutenberg University Mainz (JGU) have used computer simulations to study the arrangement of stiff polymers in spherical cavities. These confined systems play an important role for a wide range of applications, such as the fabrication of nanoparticles for targeted drug delivery and for tailored nanomaterials. Furthermore, the investigated systems can give crucial insights into the inner workings of biological problems where confinement effects are crucial, such as the packaging of double-stranded DNA in bacteriophage capsids and the self-assembly of actin filaments in cells. 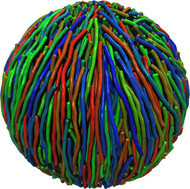 The simulations have demonstrated that fully flexible chains are homogeneously distributed inside the spherical cavity, with an unstructured surface at the confining sphere. However, when the stiffness of the chains was increased, the polymers aligned in a parallel fashion with the chain ends ordered on a common equatorial plane. At the same time, complex structures emerged on the sphere surface. At low densities and intermediate stiffness, the chains formed bipolar patterns (see Figure 1), as they are known from onions and globes. 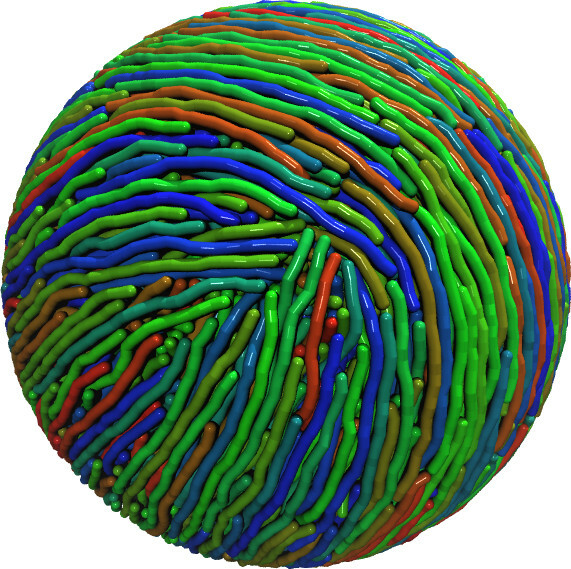 As the density and stiffness was increased further, the texture changed to a tennis ball-like structure with four distinct poles (see Figure 2). These highly unusual states originate from the complex interplay between the packing and bending of the individual polymer chains. On the one hand, it is entropically favorable for stiff polymer chains to align parallel to each other. This so-called nematic phase is, for instance, crucial for the functionality of liquid crystal displays. On the other hand, the spherical confinement impedes such an order throughout the whole system so that the chains close to the sphere surface have to bend, which is energetically unfavorable. The resulting structures are then the compromise out of these constraints. The simulations provided the first opportunity to observe and study the self-assembly of stiff polymers in spherical cavities. The researchers around Dr. Arash Nikoubashman and Professor Kurt Binder are confident that their work will help to elucidate the behavior of both naturally occurring and synthetic soft systems in confinement.